Did You Know Caregiving for Mom Can be Different than for Dad? Home \ Healthcare Resources \ Blog \ Did You Know Caregiving for Mom Can be Different than for Dad? 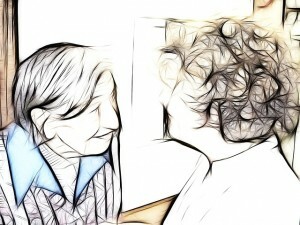 Caring for aging parents is a challenging, emotional, and unique experience. With approximately 47% of people in their 40s and 50s caring for aging parents and young children, the experience is particularly trying. This group of caregivers, known as the Sandwich Generation, comprises a population of 24 million caregivers who are trying to meet the needs of their parents. The typical Sandwich Generation caregiver is female, in her mid-40s, married, employed, and cares for her family and an elderly parent (typically her mother). One important thing for caregivers to consider is the difference in care mothers versus fathers may need. Due to different health issues, difference in relationships, and social constructs, caregiving needs vary based on the individual being cared for. On average, women outlive men by five years and the challenges of aging tend to be more pronounced in older women. Elderly women are three times more likely to be widowed or living alone and spend more years and a larger percentage of their lifetime disabled. What does this mean for Sandwich Generation caregivers? Odds are they will likely care for their mom and care for her for a longer period of time. With a variety of conditions and diseases afflicting aging women, here is a list of some of the most common. Alzheimer’s disease is the most common form of dementia and causes issues with memory, thinking, and behavior. Symptoms usually develop gradually and deteriorate over time, eventually becoming severe enough to interfere with daily tasks. According to the Alzheimer’s Association, women have a higher prevalence for developing the disease than men (65 percent vs. 35 percent). Multiple sclerosis (MS) is a disease that can impact your brain, spinal cord, and optic nerve function. The disease may cause problems with vision, balance, and muscle control. While some people have mild symptoms and don’t need treatment, others will have trouble functioning on a high level and completing daily tasks. Women are twice as likely as men to be diagnosed with multiple sclerosis. Closed angle glaucoma accounts for 10% of glaucoma cases and results from a rapid increase in pressure in the eye. If left untreated, this condition may cause significant vision loss. Women have a higher risk of closed angle glaucoma diagnosis than men. Macular degeneration is a currently incurable eye disease and a leading cause of vision loss. It impacts more than 10 million Americans and females are more frequently diagnosed with macular degeneration than males. Coronary heart disease is a lifelong condition meaning once diagnosed, you have it for life. Heart disease is the number one cause of mortality in America and impacts both genders. Other cardiovascular diseases include strokes, high blood pressure, angina (chest pain), and rheumatic heart disease. While men may not live as long as women, many caregivers are helping their fathers. With a variety of conditions and diseases afflicting aging men, here is a list of some of the most common. Dementia is associated with a decline in memory and thinking skills that is severe enough to reduce a person’s ability to perform everyday activities. While men have a lower prevalence of Alzheimer’s disease, they are 8% more likely to wander and 30% more likely to be combative when suffering from dementia. As noted above, heart disease does not discriminate against gender and is the leading cause of mortality in the United States. Other cardiovascular diseases include strokes, high blood pressure, angina (chest pain), and rheumatic heart disease. Parkinson’s disease impacts the ability to move and is a progressive, chronic disorder. Nearly 1 million people in the United States are living with Parkinson’s and men are 1.5 times more likely than women to be diagnosed with it. Cancer is the name for a group of more than 100 diseases in which cells begin to grow out of control. Men have a greater frequency of cancer diagnosis than women. The family relationship is complex, multifaceted, and based on years of time spent together. While caring for your aging parent, these familial relations are difficult to ignore and will influence your caregiving style. While caring for your parents, think of them as fellow adults rather than your parents. This will help you cope with making difficult decisions and giving quality care, while giving your parent the respect they deserve. While it’s nearly impossible to take the emotion out of caring for a parent, trying to think logically and carefully about them as people (and not just as your parents) will make things easier for everyone. Put yourself in their shoes and imagine what it must feel like for them to rely on you taking care of them, when only a few years ago they were taking care of you as their child. While gender roles are blurring as we move into the future, parents still tend to fit into some stereotypical boxes. Frequently, men are conditioned to be strong, in control and independent; in turn accepting care from others may go against these feelings. Women on the other hand tend to be the nurturers and while used to caring for others, are more easily able to ask for and accept help when they need it. Ultimately, many of us will be faced with the task of caring for an aging or ill parent. It’s important to consider gender differences, the relationship you have with you parent, and what roles your parent has played in your life as you provide them with personalized care. It’s also important to avoid caregiver burnout by recognizing that you can’t do it all on your own, getting enough rest, and asking for help when you need it. Northwest Primary Care Physicians, Nurses, and Care Coordinators are here to be a resource and support team for the medical care of your aging parents. ‘Help is Here’ by Marian O. Hodges, MD, MPH and Anne P. Hill, JD is also an excellent resource for anyone dealing with loved ones with Alzheimer’s or dementia. We tailor our specialized care to the well-being of our patients and we are committed to providing the very best care.